It’s been an interesting year for the car industry and many important technological advancements have been driving it forward. Cars arriving in 2019 are expected to feature an exciting eclectic mix of EVs, hybrids and sports cars. Popular models such as the all-electric version of the Mini promise to be worth the wait, an all-new Volkswagen Golf along with the 21st century relaunch of the Land Rover Defender. There are no longer any limits in the car world (except speed limits of course!). 2018 saw the introduction of a number of electric cars, confirming that battery powered cars are finally making a breakthrough. A whole wave of brand new EVs are expected to rule the rooster in 2019 include, Porsche Taycan, MINI EV and Mercedes EQC, along with hybrid versions of the Ford Mustang. The electric car revolution has most definitely begun and in 2019 expect plenty more. Audi, Honda and Polestar also promise to launch high performance EV cars. 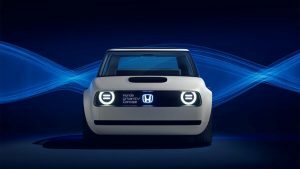 The countdown to the launch of the much-hyped upcoming Honda retro designed Urban EV electric car will be over. Will it be worth the wait? Development versions of the compact hatchback have been seen in testing recently and became famous at last year’s Frankfurt Motor Show due to the unusual boxy proportions and quirky retro design. However the model in production will maintain the boxy proportions of the concept cars unveiled at the show, in terms of the angular front bumper design and round headlights. It will differ in terms of features such as the rear-end being curvier and a revision to a five-door design, instead of a three-door layout. It’s expected range will be a modest 200-miles, coupling it up with the latest fast-charge technology. On the back of the electric car trend there has been subsequent talk regarding the charging infrastructure and improving this, which is expected to be a hot topic of 2019. There has been much interestand controversy surrounding the “driverless” autonomous cars of the future and flying taxies, at first such notions seemed bonkers, but according to recent research from the 2018 UK Automotive Consumer Study*, acceptance over the last 12 months has grown rapidly over a short time, with consumers having a brighter outlook when considering the safety of self-driving vehicles more positively. 2018 was ruled by the commanding SUV and we were spoilt for choice as more and more people are opting for 4x4s and the dynamic driving style that they bring. Sweeping the SUV market in 2019 includes the new BMW X7, and the Mercedes GLA and GLB, which ooze luxury and refinement. Before setting off, de-mist and clear your windows, a windscreen scraper and a de-icer are a necessity. You may deem the journey as essential, but realistically could it be postponed? However, if you really MUST travel please follow our tips above. Safe driving everyone!